For me, lining up for food is sometimes a necessary evil despite my aversion to it. Think of it, if we never actually endure the lineup, there will be no chance to actually try the food. Well, there are a few ways around it: either you go real early or late. 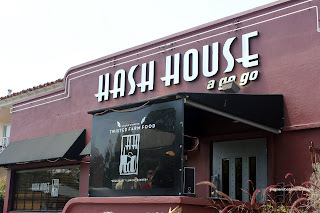 That was the original plan for Hash House a Go Go. Seeing how the lineup can be in excess of an hour, I had planned to try it out right when it opened at 7:ooam. Well, that plan didn't come to fruition. Trying to get the kids to wake up that early after a long day at the zoo wasn't exactly that easy. So despite having a late start to the day, we tried our luck. Our luck turned out to be a really l ong lineup outside. It only ended up to be 30 minutes and we actually had rock star parking. Once inside, I could see why there is always a lineup here. The plates of food were absolutely ludicrous. No human being should be able to finished those portions. Seeing that, Viv and I settled on sharing our food with the kiddies. No need to order separate meals for them. Viv decided on the Turkey & Smoked Bacon Hash which was served in a skillet. 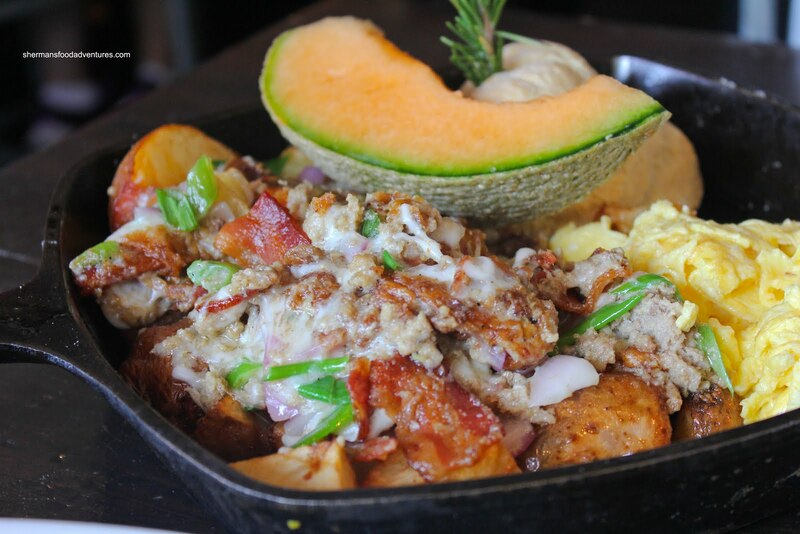 It looked really large; yet most of it consisted of fried hash brown potat oes. With that being said, there was no shortage of turkey and bacon though. Those 2 ingredients provided much of the flavour in the dish. In fact, the bacon was pretty much the dominant flavour since there was so much of it. 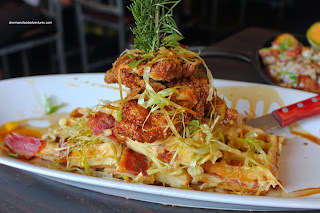 For myself, there was only one item on the menu for me - Sage Fried Chicken & Bacon Waffles with a hot maple caramel reduction and fried leeks. Despite being a novelty item of sorts, the food on the plate was tasty. The fried chicken was crispy on the outside and moist on the inside. As for the waffles, there are actually strips of bacon in them! And you know what? It worked! The bacon was not chewy or undercooked while the waffle was sufficiently crisp. Combined with the sweet reduction and the savouriness of the bacon, I felt like Brittani from Glee - breakfast confusion... Is it sweet or is it savoury? It's both! Yum... 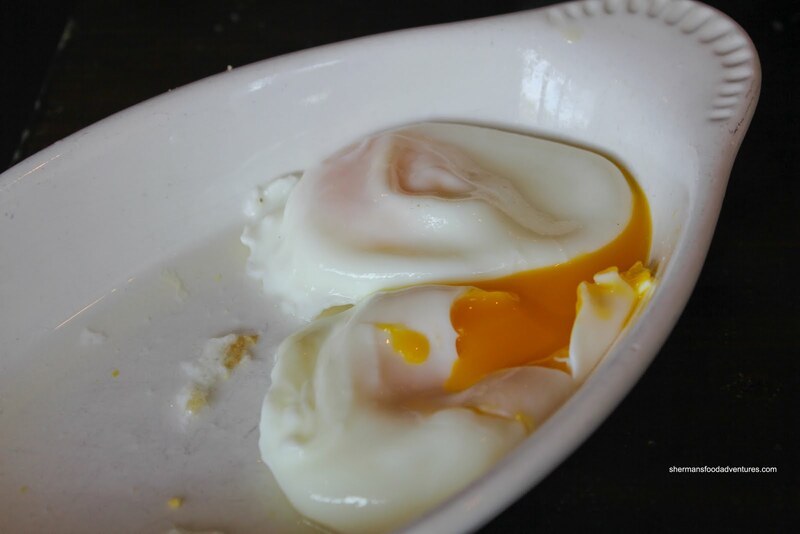 It also came with a side of eggs and I got 2 perfectly poached eggs. Believe it or not, I almost finished my chicken and waffles. Not the smartest of ideas; but it was really that good. The large portions are indeed a novelty and in a rare moment, the food is actually quite good too. 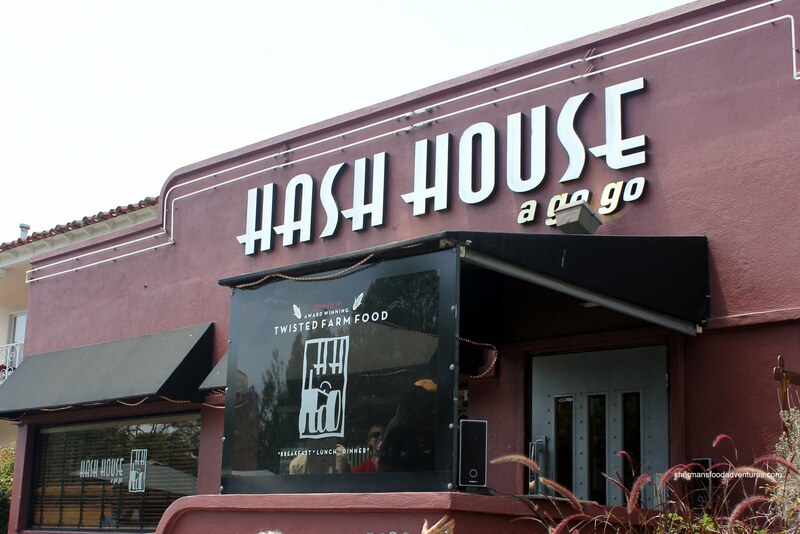 A must try for anyone visiting San Diego (or Las Vegas).